Any reasonable health goal is achievable for anyone. It has nothing to do with any special abilities as some people wish to believe. Accomplishing your health goals has always been about having the WILL to do what needs to be done in a persistent way, while ignoring all the fearful negative thoughts that try to stop you from moving forward into a better, albeit unknown, future. The only thing that’s stopping any of us from reaching our health goals is the lack of willingness to what needs to be done or fear of change. These negative thought patterns are the only obstacles on our paths. We are comfort creatures and we don’t really like change. However, change is inevitable and is what brought us to where we are today. Otherwise we would still be sleeping under the canopy of a tree in Africa. Change is something that needs to be celebrated as it allows progress; and without progress, we will have not only stagnation, but actually regression and depression. Change always benefits us as it makes us stronger and allows us to grow as humans. Even if a specific change may not seem like something that benefitted us, it always helps us become stronger and better humans, and helps develop our self worth as we see that we CAN cope with different and sometimes difficult situations. Overcoming fear and devoting ourselves to the necessary actions that need to be taken and may, at first, not always be comfortable, is the first step towards achieving anything new and better in life. 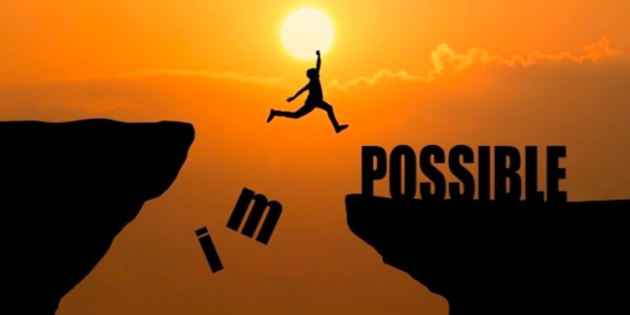 In this article, I will discuss the conflicting thoughts that stop you from achieving your dreams, and the three keys to overcoming them, so that you’ll finally achieve the health goals you’ve laid out for yourself. First of all, we all know that fear is a natural part of life. We actually are genetically programmed to be careful, since, in prehistoric times, the more aware you were of the possible dangers, i.e. the more negative you were and careful before taking a risk, the more likely you were to physically survive. Today, life is different, and the risks we take do not necessarily threaten our survival, just our perceived survival of having things remain as they are. Therefore, we need to control fear based thoughts, and the way to start is to firstly acknowledge these thoughts once they appear. This means becoming aware that we are having fear based thoughts when we are having them, and even try to understand what these thoughts are trying to save us from, and then make the decision to keep on going in spite of these negative thoughts trying to hold us back. Even though many turn to thought suppression, the fear will still linger in the back of our mind and will not free us to take the necessary actions to fulfill our desires. The path of suppressing our thoughts has long since been proven to be very counterproductive. Thoughts don’t need to be suppressed — they need to be acknowledged. You have to see them for what they are, just thoughts. They are not YOU who is thinking the thoughts. You are separate from your thoughts, therefore, you can detach yourself from your thoughts. You can also choose different thoughts. The conscious mind can only entertain one thought at a time, so if you are engaging with a negative thought, you cannot engage with a positive thought at the same time. Once becoming more aware and recognizing your thoughts, you will have a much easier time mastering them and replacing them with more beneficial thoughts. Becoming more aware, and noticing your thoughts can be very time consuming at first, and you may be shocked to see how many of your thoughts are actually negative, I was certainly shocked when I began examining my thoughts in the year 2005. It was a very eye opening time for me, since I seemed to be a very happy person on the outside, however, I learned that I was actually quite negative in my mindset and this is what brought me to a very depressing, unfulfilling and poor life at the time. When I became aware of my thoughts and changed them, my whole life changed to the miracle it is today. Changing your thought patterns takes a lot of effort. Once you recognize the negative thought, you want to aim to replace it with a thought of a solution and not of a problem. For example, when you look in the mirror and are not happy with what you see, instead of saying to yourself, “oh goodness I look horrible”, you say, “I am not so impressed with what I see but this is totally solvable, all I need to do is XYZ and slowly I will see the image I want to see”. Seeing reality as it is, is crucial, and so is taking responsibility for your current situation. When you take responsibility for your situation, you change from being a victim of your circumstances back to being a creator of your circumstances, and a creator can always change their creation. Exchanging the negative thoughts to empowering thoughts is the first step, and if you will infuse your thoughts with emotions of excitement, love, joy and fulfillment that you know will come when you achieve your goals, then you are already halfway towards achieving your goals. Furthermore, most negative thoughts are repetitive, they form default thought patterns, and once you comprehend that the same feelings have been dragging you down, it will be much easier to get out on top of them and start to control your thoughts in the direction that will benefit you and your goals. The next factor is willingness. You have to be honest with yourself and see if you are willing to do what it takes to get the results you desire. Nothing comes without a price tag. For health, the price tag includes eating more home cooked foods, which may mean that you need to be willing to cook and prepare food. It also means that you may need to be willing to adopt new dietary habits which may be different from those of your family, and to eat different foods from your family and friends. Are you willing to be different to support your health? It also means that you will need to do at least some of your shopping at a health food store instead of a close to home supermarket where you may be used to shopping. It may also mean that you are willing to eat foods that may not exactly match your palate today, but to believe that your palate will adapt with time. You also need to be willing to continue without seeing any immediate results, but to keep following blindly with a belief that you will feel and see the results with time. And it also means that you need to be willing to get off of the sofa at least three times a week and physically move your body. So, are you willing to do the things that not everyone is willing to do in order to see the results that not everyone will achieve? This is the key question, because this is what it will take for you to achieve different results and provide your body with what it needs to feel good and function at peak performance. So, are you willing? And of course, there is persistence. You only really have to stay aware of your new thoughts and be willing to make uncomfortable choices for less than two months. Then these actions will become your automatic default behaviors and will not need any more thought power or effort on your part for you to carry them out regularly. The difficult part of being aware of your actions and choices really only lasts two months. You only need to persist with effort for two months before everything runs smoothly and no more effort is required. So I ask: Is this not worth your time and effort today? Persistence during the initial period is extremely important, and without it there will be no progress. If you are willing to do what it takes to achieve your dreams, and you are willing to work on your thought patterns and improve the thoughts you choose to entertain in your mind, then you will definitely achieve your goals with time and I would love to help you achieve them! If you wish to change your health and your life, it’s time to join the Guerrilla Diet Bootcamp on our special offer page and get your special discount today, so that you too can live the life you desire, a life of peak performance that you deserve! Thought suppression. Wenzlaff RM, Wegner DM. Annu Rev Psychol. 2000;51:59-91.